First ascent West Peak Russell and George Edwards, S.D & L.W. Divers, C.L. Buddicom, G McQueen, December 1932. 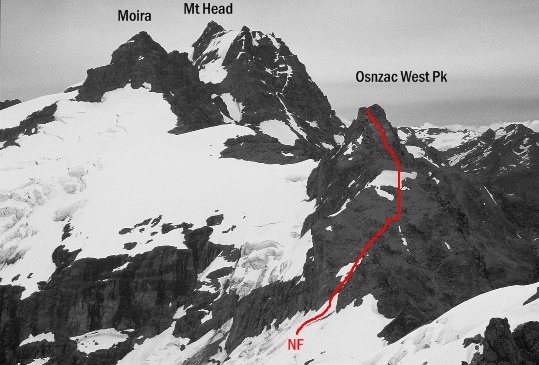 From the North Hunter ascend to the snow slope below the North East Face of Ellie and traverse to the col to the south of the peak. The West Face gives access to shingly rock terraces on the Dart side which in turn lead to a couloir on the North Face which can be followed to the top. It is possible to traverse the Osonzac Twins but it is necessary to drop on to the Dart side.